Smackdown and 205 Live are tonight in Louisville, KY. There will be four weeks of NXT taped on Wednesday at Full Sail University in Winter Park, FL. As Mauro Ranallo's absence from the SmackDown broadcast booth nears a month and may become permanent, concerns about the legitimacy of ESPN's coverage of WWE have again been raised. Singling out ESPN from a group of mainstream media outlets that provide similarly toothless reporting probably isn't entirely fair, but the prominence of ESPN and their expanding relationship with WWE has made it so they will be criticized every time they fail to give a story that is critical of WWE the attention that it deserves. A look at the fallout of the WWE "Superstar shakeup" is the lead story in the new issue of the Wrestling Observer. Have a look at the moves, chart the talent on Raw, Smackdown and 205 Live, look at the next few PPVs and different programs, and identify weaknesses on each side as well as look at possible main event programs. Also look at the death of Joaquin Roldan, the head of one of the largest pro wrestling companies in the world, and his role within AAA and the challenges that face AAA going forward. Examine the Mauro Ranallo situation with his leaving WWE, plus look at how the situation was and has changed. There were comments from people regarding John Layfield, the TV change in Layfield, the crowd reaction in Boston, the story of Justin Roberts and his passport being stolen and ESPN coverage of WWE. There is a backstage story in All Japan from 1994, while also talking about Katsuyori Shibata and his injury, and the nature of hard hitting Japanese matches and what the human body can take. Full coverage of the Sakura Genesis show and the Okada vs. Shibata match, plus look at the big picture direction New Japan seems to be going, the lineups for the next series of big shows as well as match-by-match coverage with star ratings and poll results, all inside. The Renee Young/Dean Ambrose wedding, Vince & Linda McMahon's assets, WrestleMania merchandise numbers, Kane running for mayor and his thoughts, why they did the Stephanie McMahon injury angle, Update on Kofi Kingston, Kurt Angle admits he was foolish in thinking about MMA, Backstage at Mania, Jim Ross' deal, WWE makes deal with streaming service, NFL story that has WWE implications, plus notes on the WWE house show schedule for the next year, Kevin Owens DVD, most popular network shows and coverage of all the company's events this past week, all inside this issue of the Wrestling Observer. One of the two remaining roadblocks to the WWF/CBS deal was removed this past week when Chris-Craft Industries, Inc. agreed to sell its half of UPN to Viacom for $5 million. Chris-Craft had sought to block a clause in its dual ownership contract of UPN with Viacom, which gave either side the right to order the other to either sell its half or buy out the other company's half. Viacom had, through that clause, ordered Chris-Craft to make a decision by 3/20. A six-pack challenge for a future shot at the WWE title is advertised for tonight's SmackDown, with Luke Harper, Erick Rowan, Mojo Rawley, Dolph Ziggler, Jinder Mahal, and Sami Zayn in the match. Kevin Owens will also issue a "Face of America" open challenge. Austin Aries vs. TJ Perkins is scheduled for 205 Live tonight. 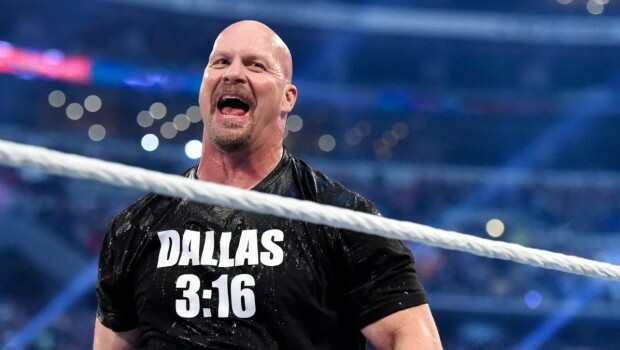 From Chris Aiken on why Steve Austin wasn't at WrestleMania this year: "Steve Austin sold his Broken Skull Ranch property outside Tilden, Texas. He revealed the news about the 2,100 acre ranch on his podcast. In going public with the news, Austin also dispelled rumors related to him not appearing at WrestleMania 33 in Orlando. He said any rumors of him being at odds with WWE are false, and added that he missed attending WrestleMania because he was too busy with the process of selling the ranch property, among other reasons related to his schedule and workload. Austin went on to say he and his wife would like to buy another ranch closer to where they live in California. He said the traveling distance between their home in Marina Del Ray to Tilden was too far. In selling the property, Austin retained rights to the 'Broken Skull Ranch' name as his intellectual property and the new owners will rename the ranch." WWE is running a sweepstakes where people who are current WWE Network subscribers and have subscribed since before August 1st, 2014 are entered to win a trip to WrestleMania 34 in New Orleans. Those eligible for the sweepstakes have already been entered automatically and will receive one entry for every day that they've been subscribed to the Network. Bray Wyatt read "Goodnight Moon" in a video with CBS Sports' Brian Campbell over WrestleMania weekend. Kane appeared on "Kennedy" on Fox News last night to discuss the special election in Georgia's sixth congressional district and running for mayor of Knox County. TV 5 in the Philippines will now be airing WWE programming in the country. Fox Philippines had announced yesterday that they would no longer be carrying WWE. Luke Harper was interviewed by the Courier-Journal in Louisville. Baron Corbin appeared on WDRB in Louisville this morning in advance of tonight's SmackDown. Ken Anderson will be wrestling for Ring of Honor for the first time on April 28th in Hopkins, Minnesota. He'll be challenging Marty Scurll for the ROH World Television title. ROH revealed that EVIL and Hirooki Goto are set to appear on the upcoming War of the Worlds tour. KUSHIDA and Tetsuya Naito were announced for the tour yesterday. The former Simon Gotch is now going by the name "Simon Grimm." Adam Thornstowe of Reno Scum will be out of action for a while after tearing his bicep. Dave Meltzer has an article for MMA Fighting on Matt Riddle's transition from MMA to pro wrestling. ESPN's Brett Okamoto gave an update on the situation with the UFC's light heavyweight title on SportsCenter last night. Okamoto said that Dana White is ready to make Daniel Cormier vs. Jon Jones for the title at UFC 214 in Anaheim, California on July 29th, but Cormier will defend against Jimi Manuwa instead if Jones wants a tune-up fight. Ariel Helwani reported that the UFC also wants to make Germaine de Randamie vs. Cris Cyborg for the women's featherweight title at UFC 214. Alexander Gustafsson offered to face Jones in his return fight. Dan Hardy spoke to The Guardian about a possible UFC comeback. Demetrious Johnson said that his next fight won't be against Cody Garbrandt.